The demands of the global and digital economy have multiplied the finance function’s core responsibilities. At the same time, CFOs are expected to partner with their C-suite colleagues to shape long-term business strategy. When finance chiefs do their jobs well, they make a powerful impact, not only within their own department but also on their company’s overall performance—amplifying their importance to the enterprise. 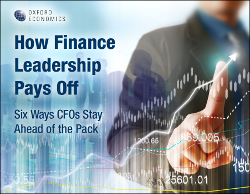 But surprisingly few CFOs give themselves high marks for effectiveness. Most see room for improvement in financial planning and analysis, a critical process for driving growth, and even in risk and compliance. What do the high-performing minority—the Finance Leaders—do differently from the rest of the pack? We asked 1,500 CFOs and other senior executives around the world about their goals and challenges. Then we identified six traits that make a Finance Leader, including excellence in core finance activities and strong influence over strategy. Only 11.5% of our survey respondents, qualified as Leaders. Yet our results show these six practices boost business performance and efficiency, as well as governance, risk, and compliance (GRC) effectiveness across the company.